We’d love your help. Let us know what’s wrong with this preview of Jane Austen Lied to Me by Jeanette Watts. What college girl and Jane Austen fan doesn't dream of meeting Mr. Darcy? Lizzie was certainly no exception. But when Darcy Fitzwilliam comes into her life, he turns out to be every bit as aggravating and arrogant as Elizabeth Bennett's Fitzwilliam Darcy. So what's a modern girl to think, except, "How could my hero be so wrong? To ask other readers questions about Jane Austen Lied to Me, please sign up. Jane Austen Lied to Me is my first introduction to Jeanette Watts’s writing. Wow! She is a good writer. I found this book to be quite entertaining with so many laugh out loud moments. If her other books are this much fun, I want to go back and read them. Hoping to in the near future. 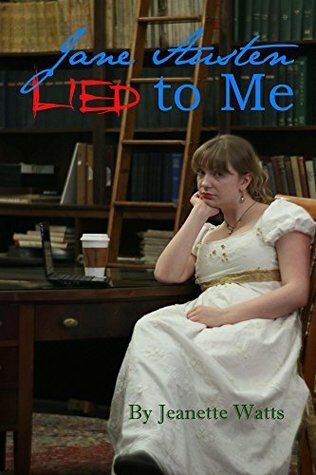 I give Jane Austen Lied to Me 4 stars and recommend it for those who love a good laugh. This is such a fun book to read! Lizzie Barrett is a Janeite; she loves all things Jane Austen and often finds herself comparing real life to her favorite books. But she quickly realizes that reality isn’t like her books and there is no script for life. The tears, heartache and soul-searching she does throughout this book make the story very relatable to readers. I am a big fan of the classic novels by Jane Austen, the Bronte sisters, etc. I felt like I could really relate to Lizzie’s character b This is such a fun book to read! Lizzie Barrett is a Janeite; she loves all things Jane Austen and often finds herself comparing real life to her favorite books. But she quickly realizes that reality isn’t like her books and there is no script for life. The tears, heartache and soul-searching she does throughout this book make the story very relatable to readers. I am a big fan of the classic novels by Jane Austen, the Bronte sisters, etc. I felt like I could really relate to Lizzie’s character because as a young girl it’s hard to realize that life isn’t going to end up the way it is in their books. Lizzie’s story kind of reminded me of my own youth and the eye opening drama that occurred in my life. I thoroughly enjoyed this book and i know it won’t be the last one I read by Jeanette Watts. As a fan of Jane Austen and an Anglophile (yes, I have been to Jane's grave at Winchester Cathedral!) this book was right up my alley. It was a bright, entertaining read. I also like that it was from Lizzie's point of view and I could easily hear her telling her own story, albeit from Jane's perspective. A unique form of storytelling. Hmmmm, maybe Jeanette's next book should be about the Brontë sisters, or a spin-off of Barchester Towers? Watts has really nailed this genre. I absolutely her quick witt and comedic relief. She writes the perfect novels to get lost for a while and they are always light hearted which some times you really need! I loved the theme of this novel. The setting and the heart of it are something most everyone can relate to on some level. Watts spins the things we know and gives us hope and humor to combat the deeper elements. This novel really managed to pack a very witty and fun punch. She has written the perfect novel to get lost for a while and it is very light hearted which some times you really need! I loved the theme of this novel. If you are looking for a laugh out loud funny and quick read, this is definitely for you. Fun and fresh! I loved the wit and humor Jeanette Watts brought to her novel and characters. I was very happy with everything I learned and how easy it was to follow. There was an emotional element to this novel that coincides with the title. This was just an overall authentic read with a feel good read undertone. Picture a young lady in her first year of college. She has read all of Jane Austen's books many times. She finds herself judging all relationships by these stories. She gets in lots of trouble with this technique. Is a fun read with characters to both like and dislike. Thanks to Goodreads. I seriously enjoyed this novel and how it was written in such a whimsical way. This was just a great escape of a read! What a delightful, fun, and entertaining read. I really enjoyed this book! This was a fun little read and a fun "walk down memory lane." Jane Austen does lie, but she lies so beautifully and satirically. It's impossible to stay mad at her. Life isn't always like a Jane Austen novel, as college freshman Lizzie soon finds out. She keeps comparing the men she meets at school to her favorite literary characters and most don't seem to measure up. But as Lizzie struggles to figure out what she really wants in life, the answer might be staring at her right in the face. What a simple but charming read! While the character of Lizzie could have easily been a cliché, there was a little bit of quirkiness and an independent streak that sets he Life isn't always like a Jane Austen novel, as college freshman Lizzie soon finds out. She keeps comparing the men she meets at school to her favorite literary characters and most don't seem to measure up. But as Lizzie struggles to figure out what she really wants in life, the answer might be staring at her right in the face. What a simple but charming read! While the character of Lizzie could have easily been a cliché, there was a little bit of quirkiness and an independent streak that sets her apart from other female characters in the genre. While the book obviously delves into Lizzie's relationships with men, I thought it did a good job depicting the whole college experience, particularly Lizzie's uncertainty at what she wanted to do for a career. Overall, this was just a fun and easy read and I ended up reading it in one sitting. Jeanette Watts is a writer, dancer, seamstress, actress, fencer, video producer, and teacher. There aren't enough hours in the day to fit it all in. But she tries.